Canadian forces have a lot of catching up to do. But today the UN is better able than ever to use their help. Canada has a lot to offer, writes Walter Dorn, given its bilingual capability and well-disciplined and well-equipped forces. Canada really is back. With the announcement in Saguenay, Que., on Friday by four cabinet ministers, the government has finally made concrete commitments for more effective peace operations. And not a moment too soon, as the United Nations tackles enormous challenges in Africa, the Middle East, and elsewhere. In particular, the United Nations urgently needs exemplary professional forces that are combat-ready to keep the peace and enforce peace agreements in war-torn regions of the world. Dozens of UN operations from the past have shown what can be done by dedicated military, police, and civilian personnel. They have helped bring to independence countries like Namibia and East Timor, and to solidify peace agreements like the ones that ended armed insurgencies in Central America. And a peace agreement has just ended the internal war in Colombia, with peacekeepers expected to be deployed soon. The great trials and failures of UN peacekeeping in 1993-95 in Bosnia, Somalia, and Rwanda, only show how important it is to have well-equipped, well-disciplined and well-trained forces. And the United Nations itself has made many improvements both at its headquarters in New York and in its field operations. Today, the United Nations is better able than ever to use Canadian help. Generous pledges were made by many states at the Leaders’ Summit co-chaired by President Obama in September 2015 but Canada was absent then. 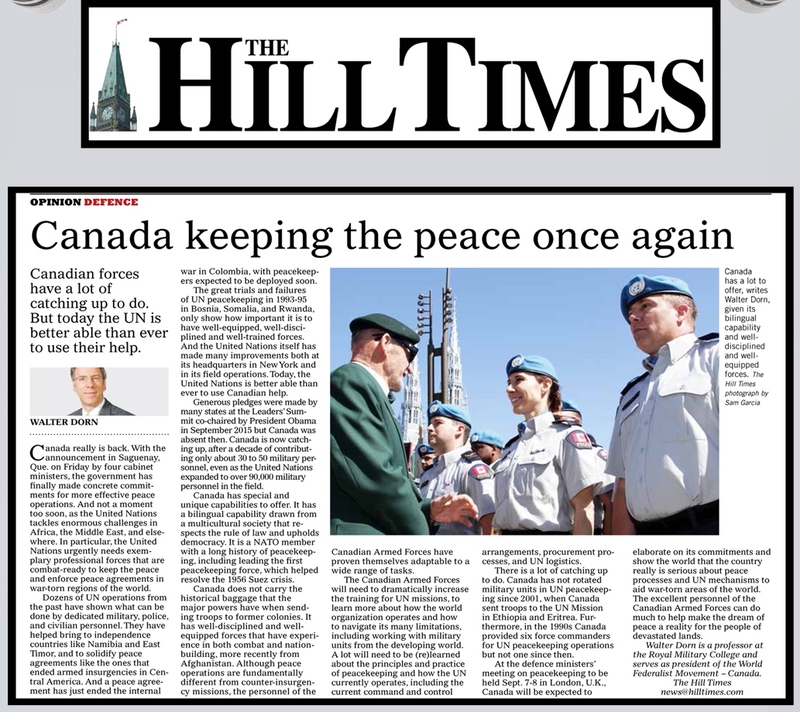 Canada is now catching up, after a decade of contributing only about 30 to 50 military personnel, even as the United Nations expanded to over 90,000 military personnel in the field. Canada has special and unique capabilities to offer. It has a bilingual capability drawn from a multicultural society that respects the rule of law and upholds democracy. It is a NATO member with a long history of peacekeeping, including leading the first peacekeeping force, which helped resolve the 1956 Suez crisis. Canada does not carry the historical baggage that the major powers have when sending troops to former colonies. It has well-disciplined and well-equipped forces that have experience in both combat and nation-building, more recently from Afghanistan. Although peace operations are fundamentally different from counter-insurgency missions, the personnel of the Canadian Armed Forces have proven themselves adaptable to a wide range of tasks. The Canadian Armed Forces will need to dramatically increase the training for UN missions, to learn more about how the world organization operates and how to navigate its many limitations, including working with military units from the developing world. A lot will need to be (re)learned about the principles and practice of peacekeeping and how the UN currently operates, including the current command and control arrangements, procurement processes, and UN logistics. There is a lot of catching up to do. Canada has not rotated military units in UN peacekeeping since 2001, when Canada sent troops to the UN Mission in Ethiopia and Eritrea. Furthermore, in the 1990s Canada provided six force commanders for UN peacekeeping operations but not one since then. At the defence ministers’ meeting on peacekeeping to be held Sept. 7-8 in London, U.K., Canada will be expected to elaborate on its commitments and show the world that the country really is serious about peace processes and UN mechanisms to aid war-torn areas of the world. The excellent personnel of the Canadian Armed Forces can do much to help make the dream of peace a reality for the people of devastated lands. Walter Dorn is a professor at the Royal Military College and serves as president of the World Federalist Movement – Canada.